I added nearly one hundred miles to my ride across Colorado bringing it to over five hundred, dipping down to Trinidad, almost on the border with New Mexico, to visit the only Carnegie of the thirty-five in the state that I had yet to get to. It took me over the 9,941 foot Cucharas Pass on a road known as the Highway of Legends, that I had nearly to myself. It also provided me with my quietest and most pristine campsite in a lush pine forest on a thick bed of pine needles. Trinidad sits at the foot of the Western Range due south of Denver, Colorado Springs and Pueblo, all genuine metropolises. It sprawls for nearly five miles along Interstate 25 that connects it with its northern big brothers, but it is more small town than large despite the string of fast food franchises that cluster along the interstate just a couple of blocks from its Main Street. It's Carnegie, a block off Main Street, built in 1904, has only had a modest Adobe addition to its rear providing a handicapped entrance and a little extra seating and book capacity. It nicely blends in with the stone of its original construction. 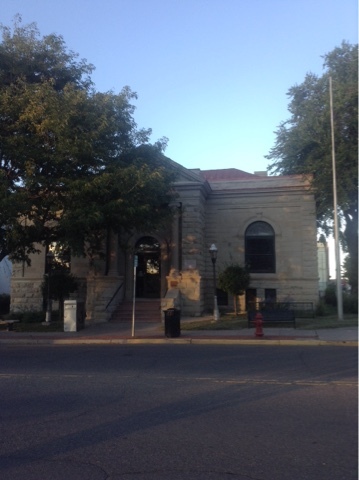 It stands across from the city hall, the other stately building in town. I could only peer in at its high ceilings and magnificent wooden shelves, as I arrived in town after closing time, less than an hour before dark. I was concerned about finding a place to camp, so when I saw a rundown motel with folk out front barbecuing and children playing, I was enticed to give it a try, but it was all booked up, seemingly by full-time residents. I didn't mind at all heading out of town into the wide open flats. Before I had left the sprawl I came upon a closed-down restaurant that I could camp behind. 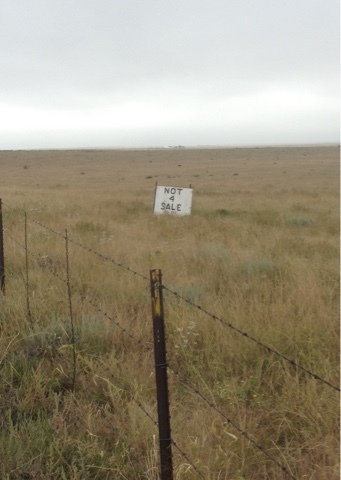 It was a harbinger of things to come as I headed out into the lightly settled high country preceding the Plains. 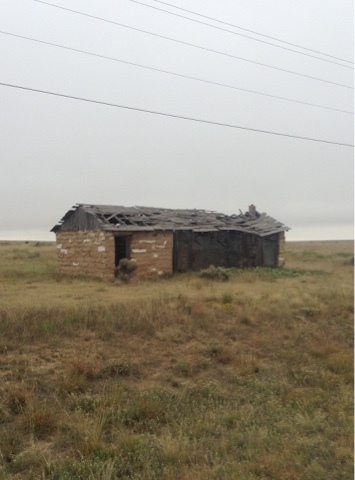 I passed abandoned homesteads every ten or fifteen miles. They provided places to camp in the days to come. Not everyone though had abandoned their homes and gone away. From Trinidad it was 69 miles until the next town of Kim on a road that I was riding for the first time. I supplemented my four water bottles with a half gallon of an orange drink reputed to have Vitamin C from a Dollar Store, the only place for food in many small towns in rural America. The person at the cash register is programmed to ask, "Did you find everything your were looking for?" For once I was able to say "No," as I hadn't been able to find the Ramon. The clerk said the local fire department had been in the day before and bought a bunch, but he was able to find me one last five-pack. That meant I would have enough food for the long stretch ahead of me, which was followed by another 51 miles before another town. It was lucky I had the reserves, because when I arrived at Kim shortly before dark its grocery store had closed. I was happy to make it before dark, even though I would have had enough water to make it through the night. Though the sun shone bright all day, it wasn't excessively hot. It was a challenge to find shade other than what my bike provided. The only natural shade I came upon was a string of trees along a creek bed and then at a closed down art gallery at the only intersection in the 69 miles. The quiet of this wide open empty space was only broken every ten or fifteen minutes by a rare passing vehicle. I had hoped to have a gradual descent from the 6,000 feet elevation of Trinidad, but I only lost four hundred feet to Kim while the road had undulations of two to three hundred feet. The air had been still and relatively cool until mid-afternoon when a strong head wind kicked up reducing me to eight miles per hour. But at least my water was holding out and there was no necessity of rationing it or not having enough to make it through the night if I didn't reach Kim before dark. When I arrived at the speck of Kim half an hour before dark. It wasn't much larger than its name. I stopped at the only business that was open, a garage with a mechanic out front working on a flat tire. I filled my water bottles and asked if it was okay to camp in the town park. The mechanic said he had a campground back a block. It wasn't marked. Two large RVs were parked there, local residents. It included a small cell block with two bathrooms and a shower. He told me that if I needed food a rodeo was being held a half mile up the road. That would have been an irresistible strand of Americana, but I was too exhausted to leave my tent, especially in the dark. After going 69 miles without services, 51 miles didn't seem daunting at all. It took me to the significant town of Springfield, complete with a library in the town's municipal center. 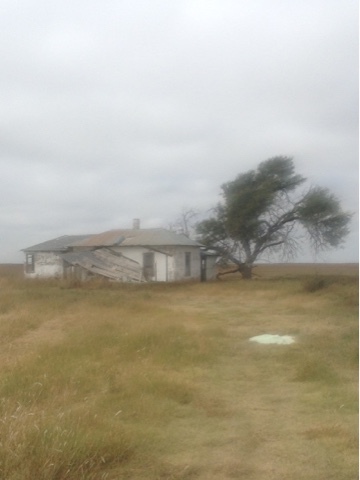 I had dropped to under 4,000 feet as I closed in on Kansas and came upon some straggly cornfields. Those with irrigation were much more healthy than those without. It wasn't until I crossed into Kansas that the corn and soybean fields became more prominent than the wild grasses. For over fifty miles through Colorado I passed through the Comanche National Grasslands, almost taking me back to pre-Columbian times. It was only fitting that my first campsite in Kansas was tucked into a cornfield. I went down a dirt track a quarter of a mile from the road before I found a nook to nestle in as dark descended, further secluding me. Not long after the sun peeked over the horizon the next morning a truck drove past as I was eating breakfast. Surprisingly, it didn't stop, nor did it summon a police officer as has happened to me on other occasions by someone perturbed by an intruder. Such a thing wouldn't happen in Europe where people are accustomed to touring cyclists. In the US someone, especially someone older, traveling by bike is suspect--homeless or illegal immigrant or ne'er do well of some sort, maybe even one of them terrorists, or so people fear in these times. I had camped fifteen miles out of Montezuma. I stopped at its town park to wash and replenish my water. A retired farmer who had moved to town seven years before stopped for a chat. I asked if there was a cafe in town where I could get a stack of hotcakes. He said if I continued down the road and turned just past the high school there was a cafe a couple blocks further. "Is that Main Street," I asked. "I don't know the name of the street," he replied. "It's some Indian name. I can't keep them straight." There was also a library a block further, but not a Carnegie. Kansas has 66 of them, but only ten in the western half of the state. I'll have to go over one hundred and fifty miles further to Wichita to the first one I haven't already visited. Then I'll have a cluster, including the final one that Carnegie funded anywhere in 1921. 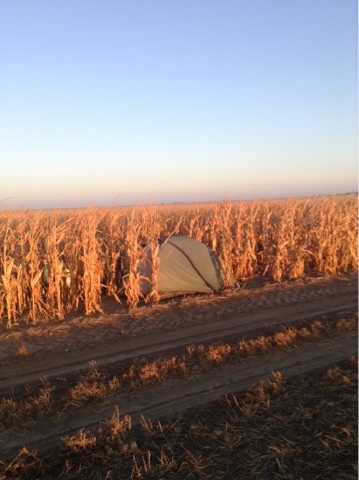 I have camped in cornfields too, only more in the middle, out of eyesight. I have driven these roads, high lonesome. They call the wind Mariah. George, if you are going through the Kansas City area, let me know. I'm in Olathe, on the southwest corner of the Greater KC metropolitan area. George have you ever had a gun pointed at you by a farmer in the US, or is that just the stuff of movies? Andrew: The only time I've had a gun pointed at me was in Turkey, when a masked man shoved a shotgun into my chest after I opened my tent in response to him throwing my bike up against it in the pitch dark. I thought I was a goner, but all he wanted was my wallet.